The journey to find rest begins with – my need. 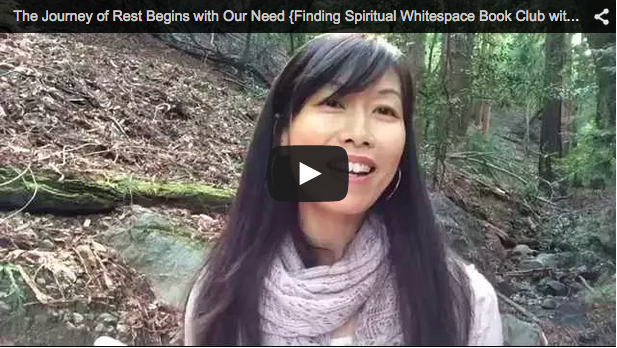 I’ve never had to think about my need prior to my journey to find spiritual whitespace. I’ve always been able to push through and just do my best to cope, manage, problem solve and be “fine”. When really, I was numbing myself to the parts of me that really longed to known, to rest, to come alive — apart from stress. I know some of you may be feeling hesitancy or even anxiety to stopping — to rest and spend alone time with God to nurture yourself. Because what if you’d discover there was a lot of need and you weren’t sure how it could be filled? In addition to what I shared in my book in the Introduction and in Chapter 1: Desolate Places — I went yesterday to a very special place where a brook runs through the woods, to offer some heart-felt words of encouragement. Just for you. But there comes a time when it takes more faith to fall apart with Jesus than to stay strong enough to stop it from happening. Are you surprised? I am so moved because I believe it touches our very human need for someone to hold us, our need for a place where we can just rest. Is that after all the sweetness of intimacy and love we have with a confidante? Why wouldn’t time with God be any less tender and sweet? But, those tender places in us are often the ones we hide or work hard to avoid. If we’re stressed, our first reaction is to problem solve and do whatever it takes to get rid of that “needful” feeling inside us. I’m learning I don’t ever want to push away that needful part of myself anymore. The part of me that might feel anxious, worried or confused .. or stressed. Now, I take those weary parts of me as a prompt — an invitation — to listen to my soul and feed my soul. To take time to get away with God — to refresh my heart. To receive the comfort. So, I can in turn comfort others. To receive the rest and confide in all that I cannot control, fear will overtake me, or the uncertainty that I can’t seem to chase away. You and I don’t have to problem solve anymore. Because our humanity can’t be problem solved. Our humanity needs God’s love. We need His beauty, so we can bear the hardness and the difficulty of life that touches us or our loved ones. And we need the peace and the music or a safety in our souls — so we can truly feel the joy with the tenderness of a heart that is open, vulnerable and alive. Our need is the doorway to God’s whispers inviting us to come to him. * The journey to find rest beings with our need. * If we’re not in touch with our need, spiritual whitespace will always fall last priority. * To actually create space to nurture ourselves, we first need to be aware of our emotional need and to accept it — rather than pushing it away. * Jesus accepted this and he prioritized time to pull away and rest. There is nothing shameful or weak or embarrassing about need. [confide. PRAY] Dear God. Help me to to come away with you when I am feeling my need.Help to value nurturing my soul, just like you did when you were human and faced the realities & demands of everyday life. I’m so glad you know what it’s really like to be real and you understand and love to take care of me when I feel needy. You love it when I allow you to take care of me, when I take time to nourish my body and soul and prioritize my well-being. [SHARE] Where are you on the journey to rest– surviving, numbing, or awakening? How am I choosing to respond to stress: what are the ways you survive, numb or refresh? “You love to take care of me when I feel needy…” a comfort! At the height of my stress and frustration in difficult times my heart has often complained resentfully, sadly, wearily, who will take care of me? Here is the answer. we all need a place where we can be loved as is. 😉 thnx for sharing, Esther. I have two theme songs this year: Don’t Try So Hard by Amy Grant and Just be Held by Casting Crowns. Both emphasize letting God be in charge and resting in Him. Knowing He is good and loves me. He is what I need instead of striving to accomplish more and please others (and myself). soulful lyrics… rest-inspiring. thnx for taking the time to share, Debbie! My spiritual whitespace is reading your blogs and watching your videos like the one I just did. Please keep the videos coming. I really do take them personally and to heart just like I do your blogs. Well that’s my quick note for the day. May God richly bless you and your spiritual whitespace. Always remember Jesus is crazy about you and me too. it’s great to hear you enjoy the videos! encourages my heart. Thanks, Beth! I believe I will begin to journal again, it may prove to be the outlet I need to release the darkness growing in my spirit, I don’t know if it’s hormones due to change of life I grapple with daily or if it’s purely a spiritual thing but writing it out may be the key to clarity, shoot, it can’t hurt☺️! yes, journal! can’t wait to hear how your experience feels… to write your voice, Sherry! Where am I on the journey? Most days it feel as if I’m just surviving. I never knew how draining raising a child could be. Now I know. I think it is especially hard for an introvert where just being around people is draining. All the more reason I need to fill up my tank when I can. Hi Cindy, your comment caught my attention. I’m an introvert too and kids keep us busy. I home school and so it is hard to just be by myself and have time with God in the outdoors. I feel like I am drowning. That place of surviving is tough. I am glad for this community too and I just wanted to let you know that I’m with you. I get it. Thank you for your reply. Sometimes I feel my friends don’t get what I’m going through…getting your first kid at 7 years old, abused and lots of baggage. I’m 53 never had kids. It has been a shock to my system for sure. I’m 6 months in now n things are slowly getting better. But I’ve found that when friends say they will support you n help they ‘re not always able to follow through with that promise. Anyway, thanks for listening. Cindy your situation does sound very hard. I can’t imagine what it must be like to have a child who needs so much. My heart goes out to you and I will be praying for you. Thank you for your kind words. I will pray for you too. i’m an introvert! for sure… we need to refill our soul — kids demand a lot of our soul energy :)! This thought really caught my attention – “Our need is the doorway to God’s whispers inviting us to come to him.” A doorway God wants us to open. Thank you, Bonnie, for always encouraging us to rest in Jesus with our real selves. I love the video! You have such beautiful, peaceful nature places to retreat to. it’s so awesome, you were aware in the moment it was happening…. 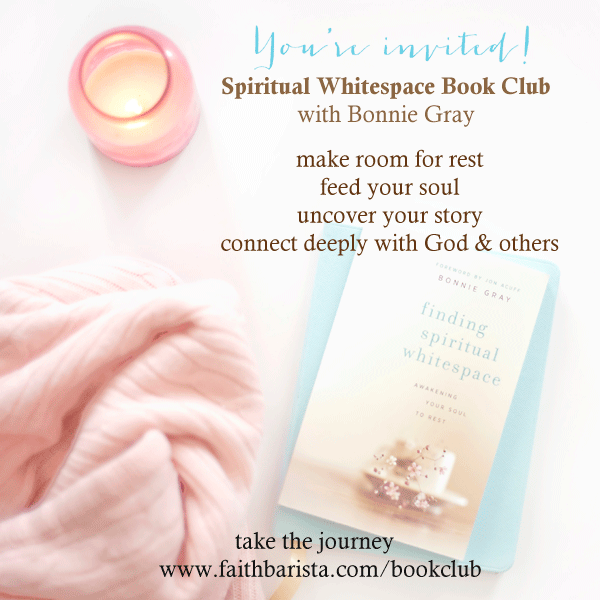 can’t wait to hear how you and your husband will be enjoying the #spiritualwhitespace time together! yay! I’m feeling brave. I know that I am numb in some areas of life where there has been great loss. It’s scary to go there. But I have to go there. I have to trust that God will hold me, love me, and not leave me. I might break and that is scary. But if I wait, I think that my unhealthy ways of coping will hurt me. I want to be healed and fly free. I am so thankful for this new community and the book club. I look forward to growing with you all. Thank You Bonnie for doing this. lisa, continue to be courageous. this journey of the soul is worth it. it’s great you’re aware. i wasn’t even aware — and even thought my coping wasn’t affecting me! 🙂 and it’s true. it might be avoided… temporarily.. but we carry the weight and internal soul stress of it. falling apart is good because it means you’ll be restoring what is real and true. 😉 God in you! I loved hearing the words in your video message. I think they partner beautifully with the messages in the book and I hope you do more as they’re perfect timing for the book club! I really enjoyed the video. Thank you for making the effort, and for sharing from your heart. Such a blessing. “When we make room for spiritual whitespace, we create space in our hearts, a blank space for Jesus to write on, a white canvas for him to paint onto, an intimate silence he can speak into, a cool, dark night sky to light a song or lyric within, an open field for him to walk through, an intimate café corner for him to whisper into, and an empty seat in the window of your soul, so he can lean in and wrap his arms around you as you both watch lightning crawl across the sky.” This is my favorite quote from ch.1. Desolate Places. It was 4 years ago, when incapacitated by PTSD along with other health issues, that God got my full attention and I gave Him the freedom to fill up the white spaces of my soul with His never failing, unending love for me. He engraved His love on my heart in the most beautiful and caring way! I am forever grateful! Now that I am blessed to be back in the mainstream of life, I find myself fighting for opportunities to find rest for the awakening of my soul to God. It’s so easy to get busy and neglect taking time to rest with God. But, praise God we have this promise, “He is whispering— I am here. In between the cracks, where you’ve left yourself standing there. In the whitespaces. Needing rest. I’m still here with you. As is.” Thank you, Bonnie, for this book club and the challenges and encouragement it brings to me (us)! Tonight, I rest with Him as I hold my tiny, 6 week old granddaughter who reflects His love to me in a deep, miraculous way! Blessings Bonnie, I’m settling in after youth group ministry today and this email, your words, have me saying lots of amens in agreement, and thank YOU Jesus through exhales of rest. I am finding rest so difficult. I’ve dealt with panic attacks, depression, anxiety, trauma – you name it. Now, I am doing better but some nights I can’t get rest. During the day, it’s hard to rest too. I’ve realized that I am a highly sensitive person and my heart breaks often over a variety of situations, etc. I have been praying more because I can’t get all that I need to get done and take care of myself, but I am tired. There are a few people (for some reason who are difficult people) I love deeply and truly feel for who I am allowing to keep me up at night. It just causes me to be sad and makes rest further off. My heart echoes this prayer of yours, Bonnie: “Help me value the nurturing of my soul.” I would add, from my own need: “Help me, Lord, to see rest (not just sleep-rest, but sit-down-and-refresh rest) as an essential part of each day–not just a luxury when the to-do list is short. Through the example of Jesus, you’ve given us your seal of approval on rest. Remind me that relaxation with You will rejuvenate my spirit, adding contentment and joy to the tasks remaining. Thank you!” And thank you, Bonnie, for becoming the champion of rest and its many benefits. May we find rest in Him to be our highest priority! 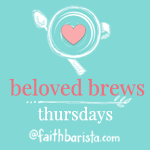 Thanks for the great post & for hosting, & God bless! I take little nature walks in my neighborhood, between caring for a disabled family member, when I can get away for a few minutes. Also, I read Christian books and follow a few Christian blogs. Other times, my room/my bed is my sanctuary to be alone with God for quiet time.